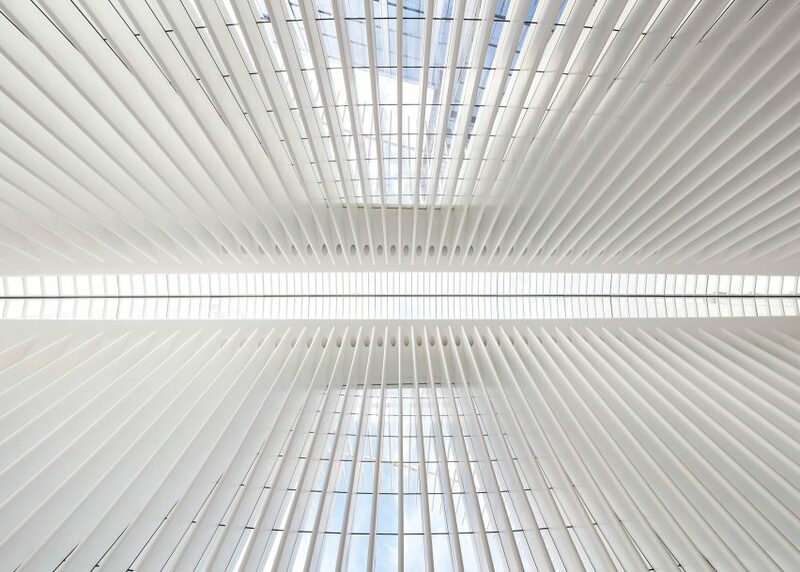 Spanish architect Santiago Calatrava's vast ribbed structure that soars over the World Trade Center Transportation Hub in New York is captured in these images by British photography duo Hufton + Crow (+ slideshow). 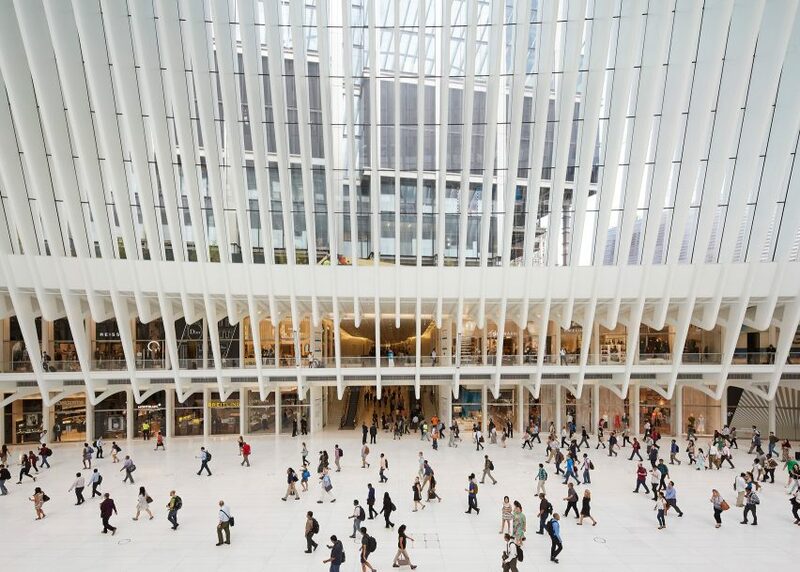 Known as the Oculus, the building is designed to bring light down into the subterranean rail station and shopping centre that quietly opened in March 2016. 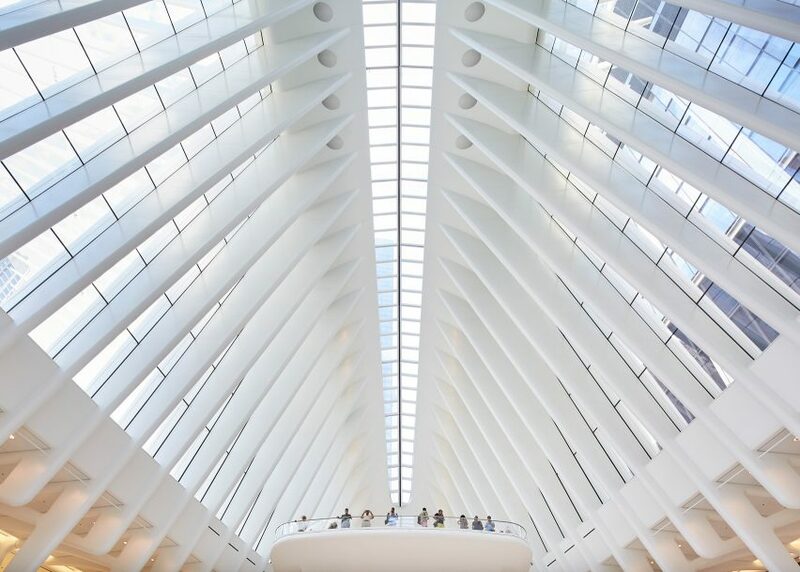 It was designed by Calatrava, whose most famous projects include the Ciudad de las Artes y de las Ciencias in Valencia and an extension to the Milwaukee Art Museum. Hufton + Crow's recent photographs show the two rows of white steel ribs that curve around each side, creating an eye shape in plan. Glazing in between these elements brings copious amounts of light into the space, which has an open floor surrounded by two levels of shops. The ribs angle inward to meet at the top, where another strip of operable glass arches over. 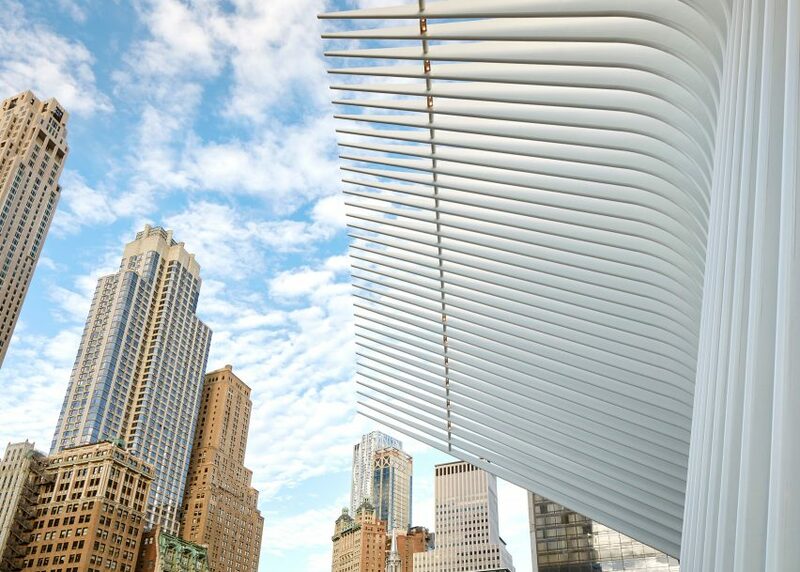 On its exterior, the ribs curve out and continue skyward to create asymmetric fins. 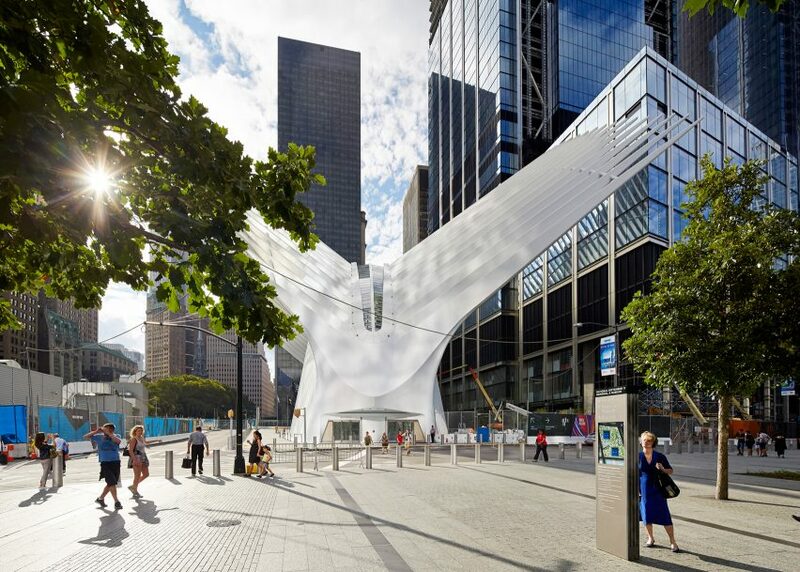 "Although suggestive of motifs from many traditions – the Byzantine mandorla, the wings of cherubim above the Ark of the Covenant, or the sheltering wings on Egyptian canopic urns – the form may be summed up, according to Santiago Calatrava, by the image of a bird released from a child's hands," says the architect's website. 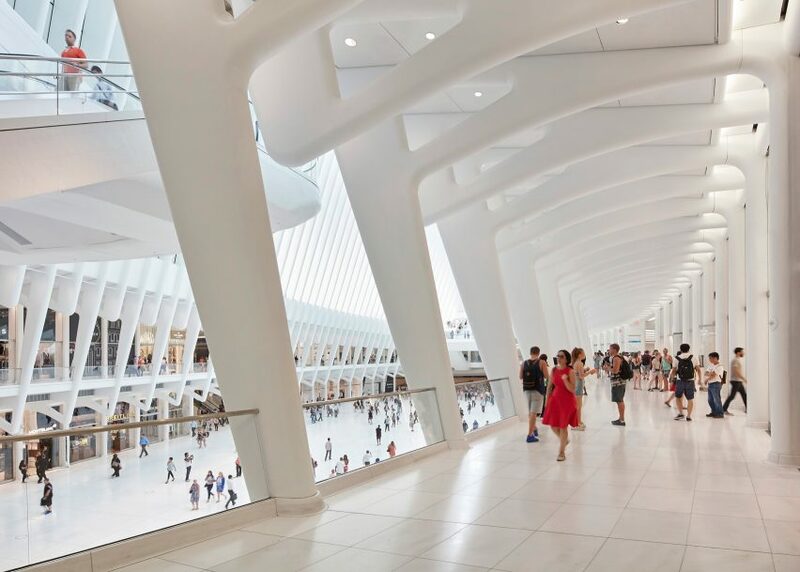 Access to the building at street level is at both east and west ends, directly onto stairwells that project into the space high above the floor and act as viewing platforms. Escalators take visitors down the remainder of the height. The mall can also be reached from the PATH and subway train platforms, and concourses that connect the surrounding buildings. 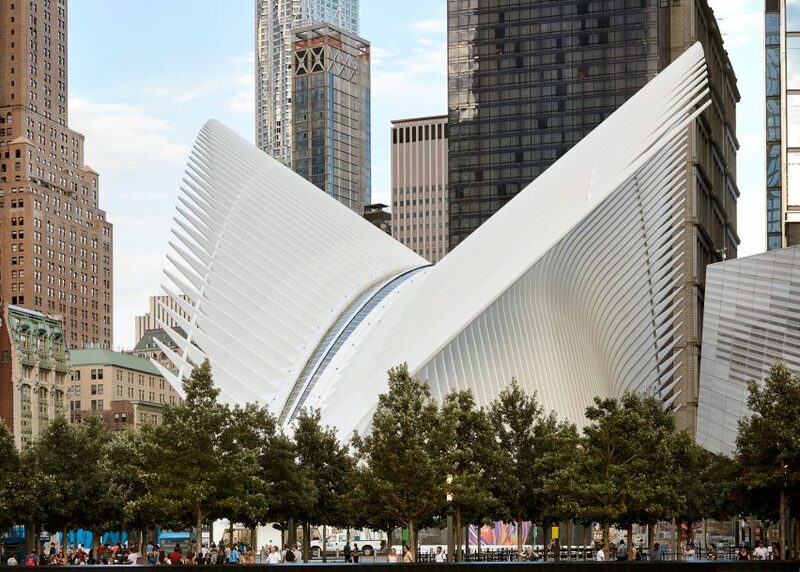 The Oculus has been accessible from underground since earlier this year, but its street-level entrances only recently opened. 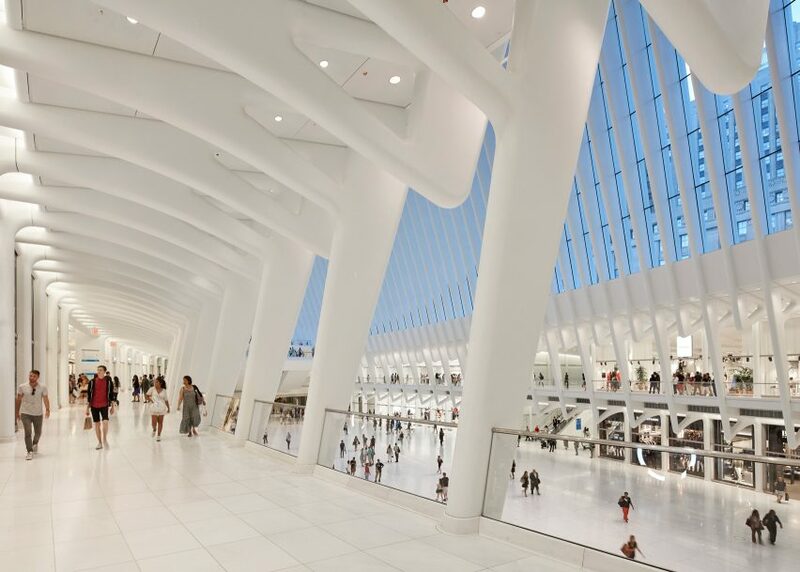 Retail spaces are quickly filling with a variety of brands. 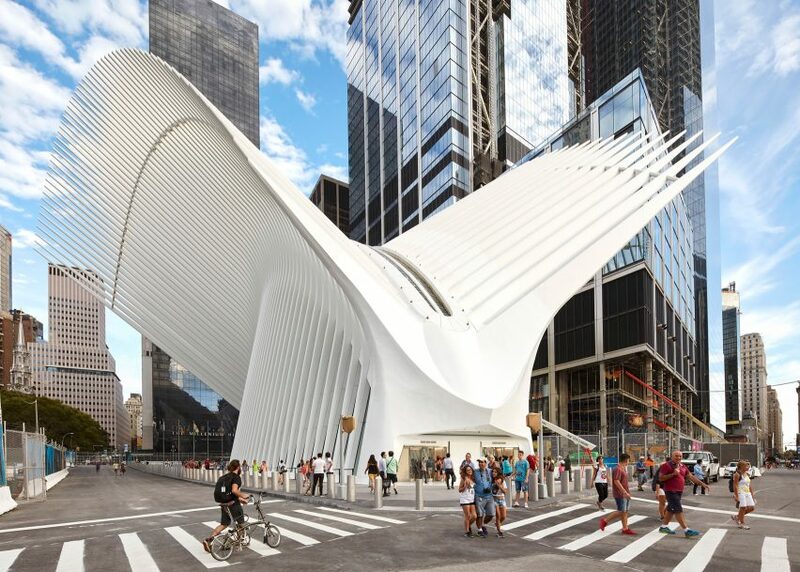 "The combination of natural light and sculptural form give dignity and beauty to the building's lower levels and pedestrian walkways, and provide New York City with a kind of public space it has not previously enjoyed," said Calatrava. 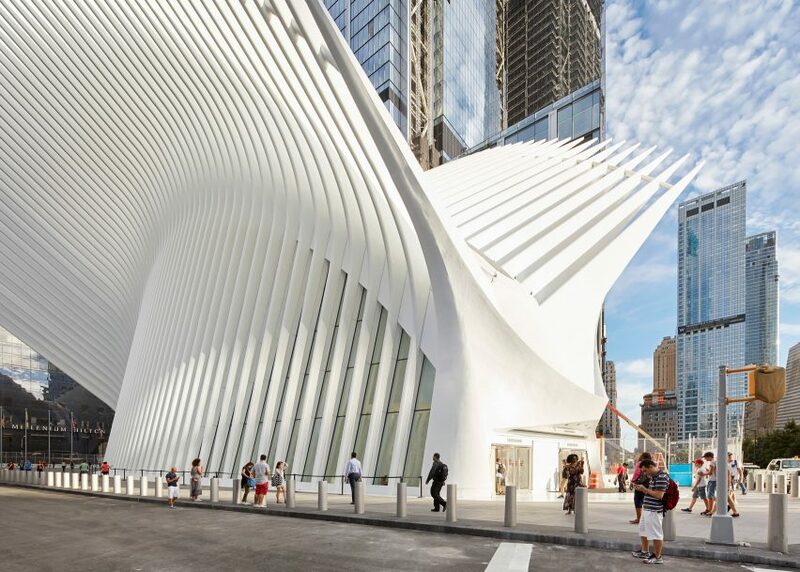 The transit hub forms part of the major redevelopment of the World Trade Center site in Downtown Manhattan, which was devastated in the 9/11 terrorist attacks of 2001. Other projects that have completed in the vicinity include the SOM-designed One World Trade Center – currently the tallest skyscraper in the western hemisphere – Fumihiko Maki's shimmering Four World Trade Center tower and a museum dedicated to the attacks by Snøhetta. 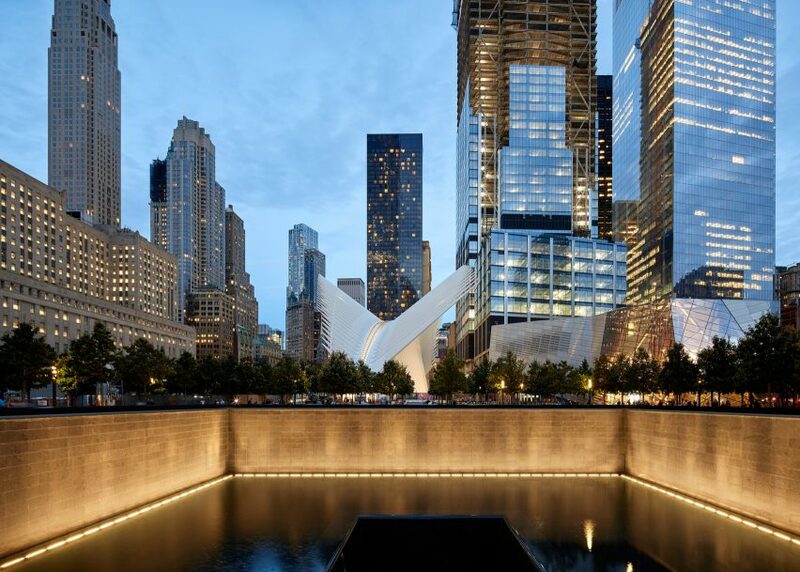 The buildings are arranged around a memorial to those who died in the attacks, which comprises two giant square waterfalls on the footprints the Twin Towers that previously stood on the site. 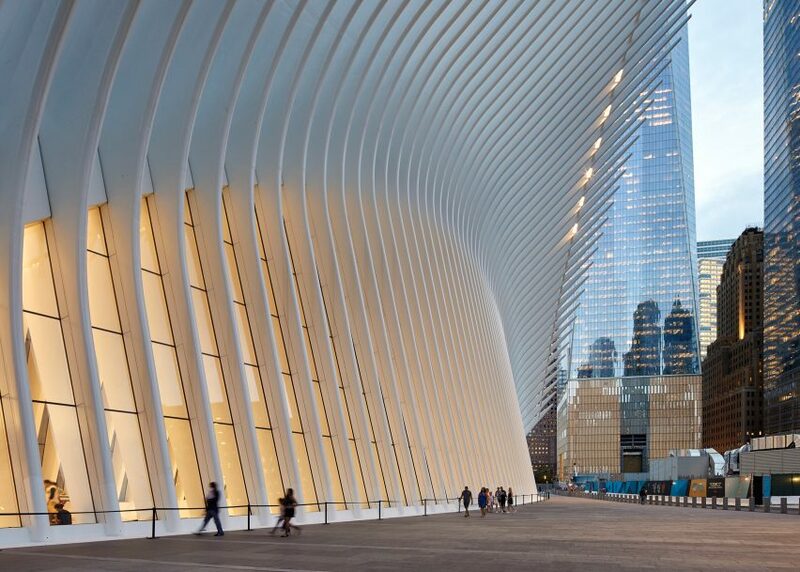 Yet to complete is the 80-storey Three World Trade Center by Rogers Stirk Harbour + Partners, which topped out in June 2016. 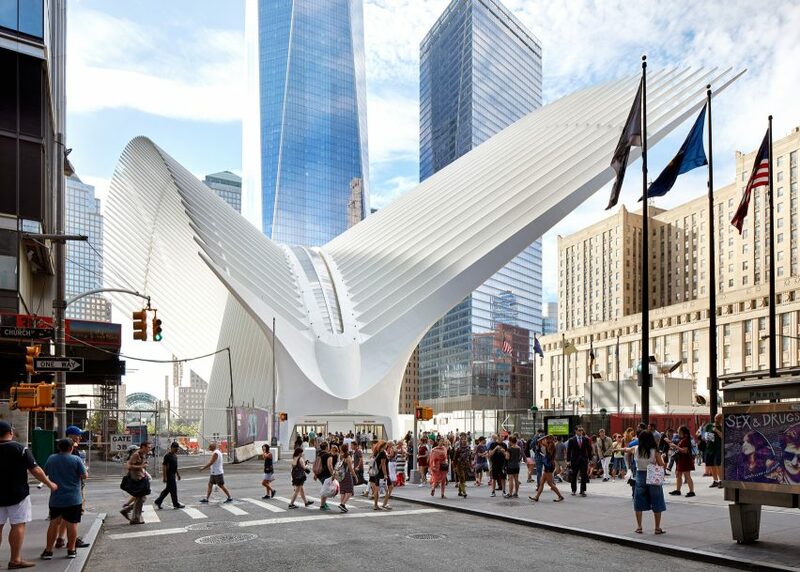 The design for Two World Trade Center – the final skyscraper for the site – is still under discussion as developer Larry Silverstein decides between proposals by Foster + Partners or BIG. 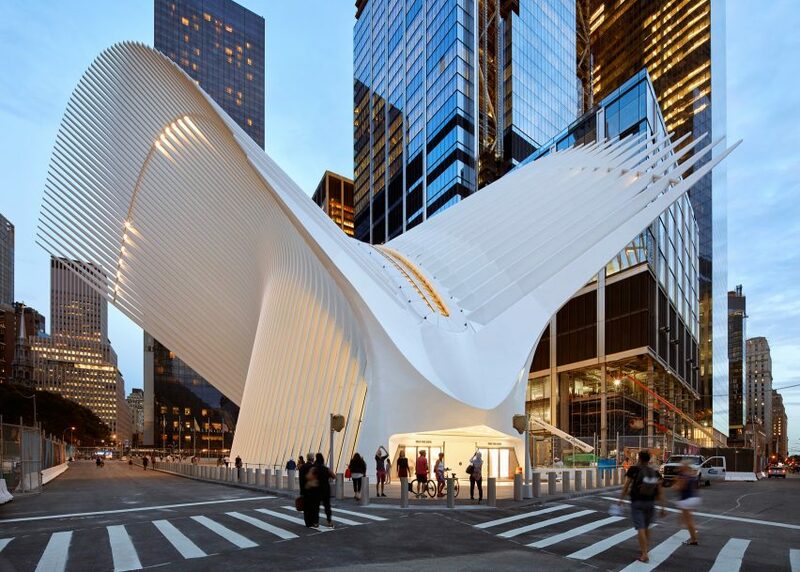 Calatrava has also designed a Greek Orthodox Church to replace a nearby building destroyed during 9/11.